There's still time to apply for a position on the 2019-2020 OSPAPPH Executive Committee! 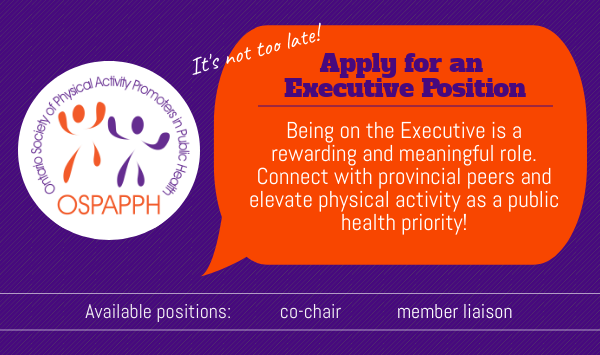 Calling all leaders in physical activity promotion! Are you a Physical Activity Specialist looking to influence the provincial landscape while enhancing your own leadership skills? Do you need an innovative way to enhance your core competencies? If so, the OSPAPPH Executive is for you! 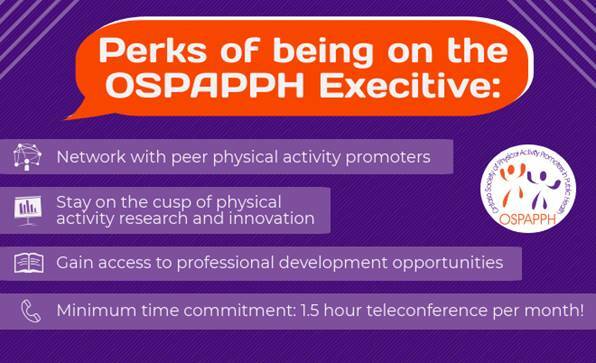 Dedication and commitment from individuals such as yourself, has enabled OSPAPPH to be a leading body in representing physical activity promoters in public health across Ontario. True to our mission, OSPAPPH elevates physical activity as a public health priority through advocacy, capacity building, engagement and collaboration. Please note that positions listed are for two years with the exception of the member liaison positions which are a one year commitment with the option to renew for the second year. We encourage you to consider the roles listed above. For more information regarding these roles, please see our Executive Job Descriptions in the linked documents. Please note that all successful applicants are asked, if possible, to attend the annual OSPAPPH Executive Face-to- Face meeting being held April 24th and 25th at Region of Peel Public Health. Meals and accommodation expenses will be covered by OSPAPPH. Less Sitting is Better - New Social Media Campaign and Toolkit Now Available! The OSPAPPH Executive and Sedentary Behaviour Working Group are excited to share the new OSPAPPH ‘Less Sitting is Better’ campaign and materials. The OSPAPPH Sedentary Behaviour Working Group has been hard at work preparing an evidence-informed and comprehensive campaign with messages targeting adults and their behaviours across the whole day. The purpose of the campaign is to raise awareness about sedentary behaviour in adults and how they can counter sedentary behaviour throughout the day. The campaign consists of a series of Social Media Posts (with accompanying images) that can be used on a variety of social media platforms (such as Facebook, Twitter, and Instagram). The campaign also includes a web-based/printable infographic that health units can use on their websites, share via email or print to distribute. The infographic has been prepared in French, English & Chinese. OSPAPPH will be launching the ‘Less Sitting is Better’ campaign via our Twitter account (twitter handle: @OSPAPPH) and website (www.ospapph.ca) and we are encouraging member health units to join us in raising awareness about sedentary behaviour. Your health unit can participate in the campaign by using the handy campaign guide (links below) prepared by the SB Working Group. The guide provides access to all the campaign materials – including timelines, suggested posts, and a preview and access to the accompanying images. The guide is also available in French and the accompanying images are available in English, French, and Chinese. The images have been saved on OSPAPPH’s Google Drive and links to the images are embedded in the guide. The campaign materials can also be shared with your community partners. We are pleased to be sharing these materials with you – our members – and we hope you will join us in spreading the word that ‘Less Sitting is Better’. If you have any questions about the campaign or have difficulty accessing the campaign images, please contact Rachael Shaffer (Rachael.shaffer@tbdhu.com), chair of the OSPAPPH Sedentary Behaviour Working Group. On behalf of the OSPAPPH Executive, a HUGE thank you to the members of the Sedentary Behaviour Working Group for their work on developing the campaign and all related materials. The highly-anticipated 24-Hour Movement Guidelines for the Early Years (0-4) were released last month, outlining how much young children need to move, sleep, and sit each day. As part of the knowledge translation activities for the new Guidelines, principal investigator Dr. Mark Tremblay delivered a webinar on December 19th, 2017 describing the comprehensive process that was taken to develop the Guidelines, the importance of focusing on movement throughout the day, and how different stakeholders can use and promote the new Guidelines. The process of developing the Guidelines was extensive! A leadership committee made up of the principal investigators, funders, research leads, and methodology consultants met over 50 times from 2015-2017. Four systematic reviews were conducted (drawing information from 271 papers), 1 meta-analysis was performed, stakeholder consultations were held, and 6 days of meetings were held to develop and reach consensus on the final Guidelines. The Guideline Development Panel did such a great job that other countries from around the world have since followed Canada’s lead and developed similar 24-hour guidelines (i.e. Australia and New Zealand). So, why do we need 24-Hour Movement Guidelines instead of Physical Activity Guidelines? As physical activity promoters, we often emphasize getting the right amount of physical activity in a day… but what about the rest of the time? There is more than just “moderate-to-vigorous” movement in a typical day, however, before the 24-Hour Movement Guidelines there was a lack of evidence-based recommendations for sedentary behaviour or sleep for the early years. In his webinar, Dr. Tremblay explained this imbalance through an enlightening comparison to nutrition guidelines: We don’t see nutrition guidelines focus on just one food group and exclude the rest – it wouldn’t make any sense! In the same way, we shouldn’t be focusing on only the most active part of the day. Guidelines pertaining to all movements (sitting, sleeping, and being active) and how they interact with each other are equally important. Read the background documents to master the content. Disseminate the press release to local media. Disseminate the Guidelines through social media platforms. Link the Guidelines on our websites. Provide hard copies of the Guidelines in waiting rooms, workshops, and as part of displays. Offer 24-hour movement workshops through EarlyON & other parent child programs. Integrate the content in all resources & presentations to parents, future parents and service providers. Provide professional development to other service providers. The Guidelines were developed in partnership with the Canadian Society for Exercise Physiology, Children's Hospital of Eastern Ontario Research Institute – Healthy Active Living and Obesity Research Group, the University of Alberta Faculty of Physical Education and Recreation, ParticipACTION, and the Public Health Agency of Canada.